Freight train set of the Dutch State Railways. 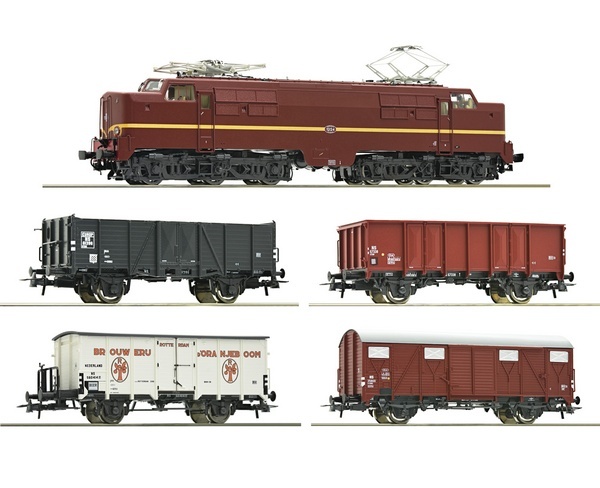 Model Description: Electric locomotive: Motor with flywheel, true to the original LED headlights that change with the direction of travel, drive on all six axles, one of them has traction tyres to increase traction power. Coupler pocket according to NEM 362 standards with close coupler mechanism. With digital decoder and digitally switchable sound and light functions as well as a buffer capacitor for an uninterruptible power supply. The Werkspoor delivered the locomotive of the series 1224 to the Dutch State Railways in 1951. It was one of three locomotives of the 1200 series, which had the typical “Brille“ and the prominent “Schnauz“. The locomotive was painted in this livery until 1957.